Overall first place winner, Alwin Hylkema, called the race the hardest he had ever done. Photo: Saba GIS. 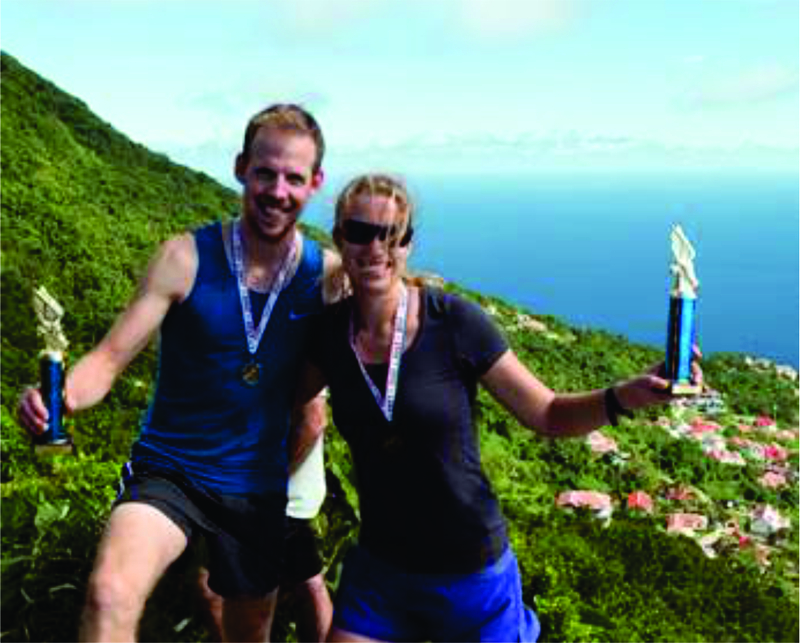 The Bottom, Saba- Alwin Hylkema and Sarah van der Horn – Plante have won male and female first place, respectively, during Saba’s annual Saba Day Run for the 42nd annual Saba Day celebrations. The race, named “Sea to Scenery” and touted as the single most robust climb in the Kingdom of the Netherlands, had 15 competitors undertake 900 meters of elevation gain as the course wound up from sea level to Saba’s majestic peak, Mt Scenery. Volunteers and event organizers cheered as racers slowly made their way up the sloping roads and trails. The race was organized by the Saba Triathlon Foundation, who use the race as a tune-up for the Saba Triathlon, which will be held on January 20th, 2018. Some of the competitors even use the race as a warm-up for the triathlon as well. “I am definitely ready for the triathlon now,” said van der Horn – Plante, who finished as the race’s top female with a time of 1 hour and 4 minutes. “I was also very impressed with the level of organization and the network of volunteers who helped make the race a great success.” Kevin Baldauf and Peter Johnson rounded out the top 3 overall finishers with times of 58 minutes and 1 hour and 2 minutes, respectively.